Thursday, April 18, 1906, 5:12 a.m.
San Francisco, the Paris of the West, was just awakening to a new day when disaster struck. The animals sensed it first--dogs barking, horses shifting and whinnying. Then, as a distant rumbling rose to a deafening roar, the quake thundered through the city. Witnesses described how they could actually see the quake coming. "The whole street was undulating," police officer Jesse Cook recalled. "It was as if the waves of the ocean were coming toward me, billowing as they came." The first shock lasted forty seconds, followed by a brief silence and another twenty-five second shock--little more than a minute in all. But to the million Californians who felt it, the quake seemed to last forever. The heaving, cracking earth toppled chimneys and towers, splintered rows of frame houses, twisted steel rails, bridges and pipelines. People and animals were crushed by collapsing buildings and falling brick walls. In the silence that followed, survivors poured into the streets, gaping in horror at the damage. The scene that met their dazed eyes looked like the end of the world. But the worst was yet to come. Fueled by broken gas mains, fires began to flare in the city. San Francisco's superbly trained firefighting crews, the best in the nation, rushed to do what they could. But the odds were stacked against them. Water was in short supply, the water mains broken, the cisterns in such poor condition that many of them were empty. And their beloved chief, Dennis Sullivan, who had trained and led his crews for years and who knew more about fighting fires than anyone in the city, lay dying in an emergency hospital, mortally injured in the quake. Most of the structures in San Francisco, especially in the vast working class neighborhoods, were made of wood. They burned like tinder. One of the worst blazes, known as the Ham and Eggs Fire, was started when a woman lit her stove to cook breakfast. Soon much of the city was ablaze. 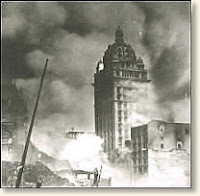 The heroic firemen were driven back as fire swept toward the towering office buildings and hotels in the downtown area. The wealthier neighborhoods had suffered little damage from the quake because they were built on solid rock. Now, with water gone, the military commander, General Funston, ordered that many of these homes be dynamited by the army to create firebreaks. Unfortunately the one man who knew how to use dynamite in fighting fires--Chief Sullivan--was gone. 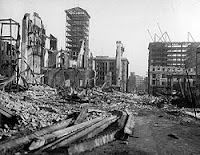 As a result, many buildings were blown up unnecessarily, and some fires were even started by the dynamite. By that afternoon the downtown area was on fire, its tall buildings going up like torches. People were leaving the city by the thousands, burdened with their most precious possessions. Some were herded to refugee centers set up in the parks and in the Presidio, where the military base was located. Some took the long road south, out of the city. Others trooped toward the waterfront--saved by the navy fireboat crews--and lined up for the ferry to Oakland. From the safety of the water they looked back on a city ablaze from horizon to horizon. The fire raged for three days. By the time the Saturday evening rain dampened the ashes, 490 blocks, totaling 2831 acres, had been burned and more than 450 lives had been lost. But the spirit of San Francisco was undaunted. Within days, aid was pouring in, and the cleanup and rebuilding had started. The city was on its way to becoming even greater than before. My April Harlequin Historical HIS SUBSTITUTE BRIDE, is set against the backdrop of 1906 San Francisco in the last days before the quake and fire. It's a story of devotion, danger and sacrifice. I hope you'll enjoy it.